KSB Pumps and Valves is intensifying its focus on aftermarket services that add value to customer operations far beyond the supply and maintenance of its own products. In future the company will also extend its services and engineering expertise to include maintenance of entire systems, reverse engineering of rotating equipment and system optimisations. This includes maintenance of third-party peripheral equipment in order to ensure its clients systems perform optimally at all times. “Our aftermarket engineering teams can also remanufacture or reverse engineer equipment that is no longer available but necessary to meet client’s requirements,” says KSB Pumps and Valves SupremeServ division manager, Grant Glennistor. He continues that all aftermarket services globally fall under the new KSB SupremeServ banner which encompasses existing and new maintenance, logistics and engineering infrastructure and is entirely focused on elevating customer assistance to new heights within the pump industry. “SupremeServ is a safety net that ensures KSB’s extensive South African, as well as global infrastructure and expertise is available to support customers’ fluid transfer projects, including equipment and related infrastructure to ensure its long-term success. Local pump users are in good hands when they deal with the company which has a history spanning more than 60 years in South Africa. The local operation also ranks as one of the top service centres within the “KSB World” of 16 000 employees in more than 60 countries. 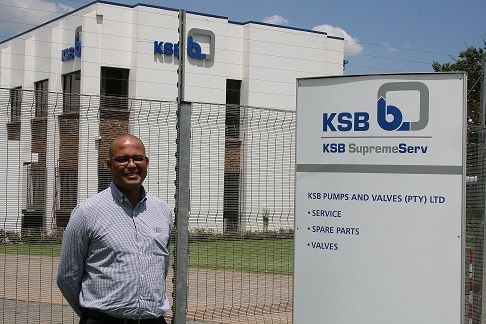 KSB Pumps and Valves SupremeServ division manager, Grant Glennistor. Simultaneously, the company has ongoing programmes to continuously improve services through constant upskilling and development of its staff in line with market requirements. This level of commitment has also led to the company qualifying as a Level 1 BBBEE provider. 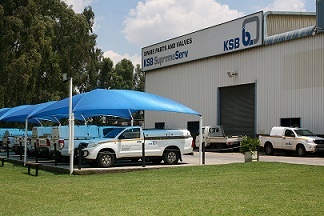 KSB SupremeServ centres are situated at all local branches with spares and standard parts available within 24 hours to service all 22 000 variants of its own pump. The centres also dedicated walk-in-centres for on-the-go-services.